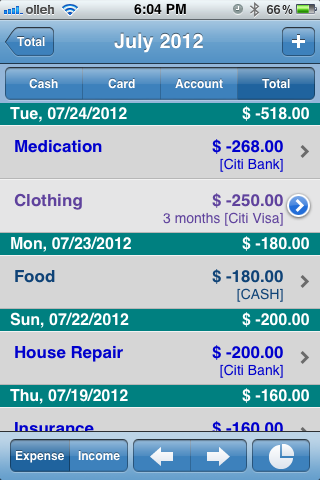 Main view shows list of money including cash and credit cards, bank accounts and shows daily, weekly, monthly, yearly reports. 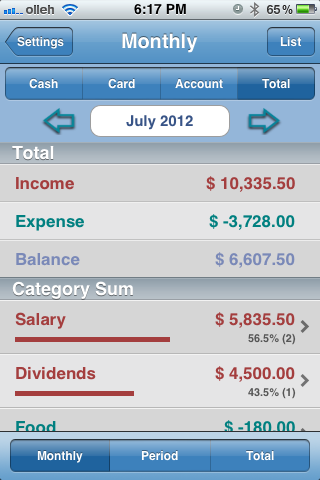 The balance shows total amount of money and when you touch the balance, it will move to Total monthly list. 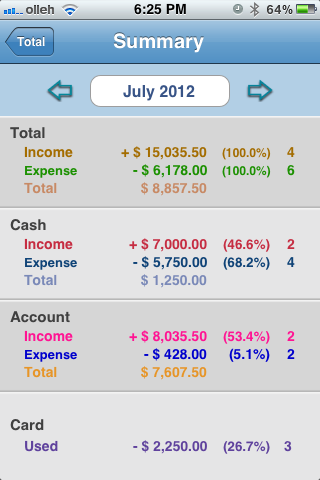 It shows total amount of monthly income and expense. It supports detail list of the month when you touch each row. 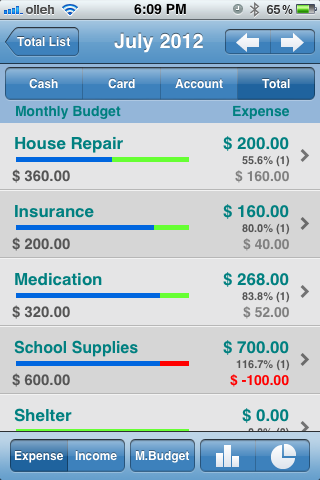 The blue button of each row supports budget comparison list. You can see easily when your data exists with calendar. 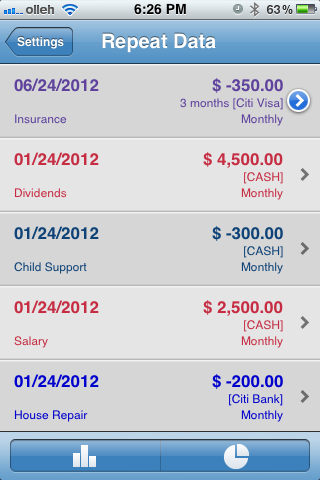 This is monthly detail list which shows all expense and income of the month by date. 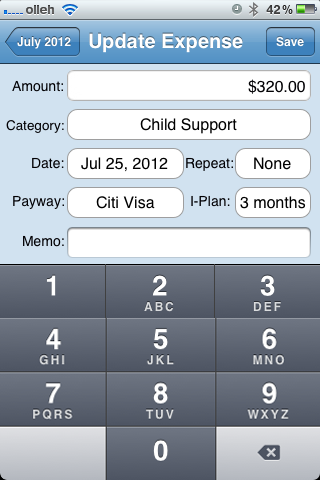 The blue button of the row supports monthly payment list of credit card expense. This is monthly payment list of credit card expense which is used in some countries only where installment plan of credit cards is used. 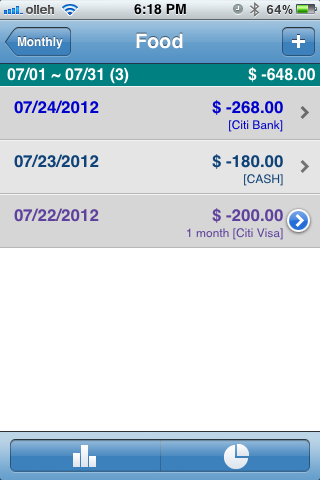 See the section About credit card for more details. 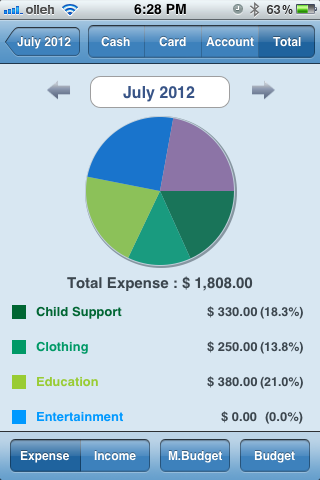 This is Budget comparison list which shows monthly budget and monthly expense and income. See the section About budget for more details. 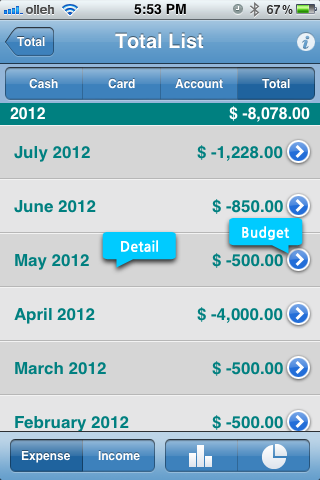 You can update or delete information of expense in the Update Expense. 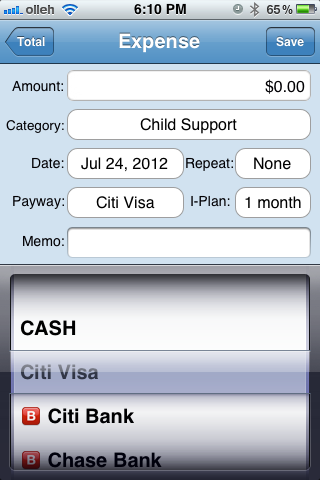 You can choose payment option with Cash or Credit cards or Bank Account. 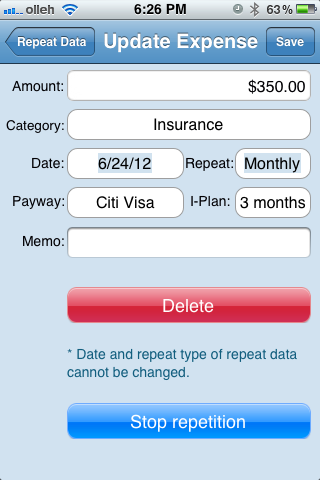 When you choose a credit card, installment plan is available to choose. It you does not use installment plan, please reset Installment plan set in settings not to use it. This is Settings List. 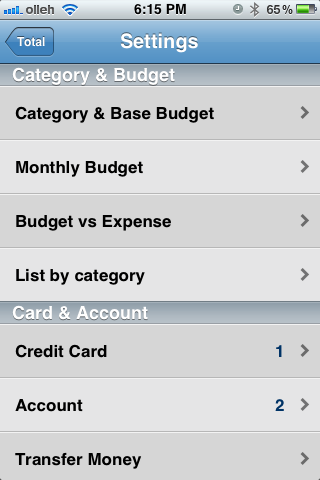 You can add categories and set base budget in the Category & base budget. When you touch each row, it moves to detail view. Base budget will be used when monthly budget will be created automatically every month. 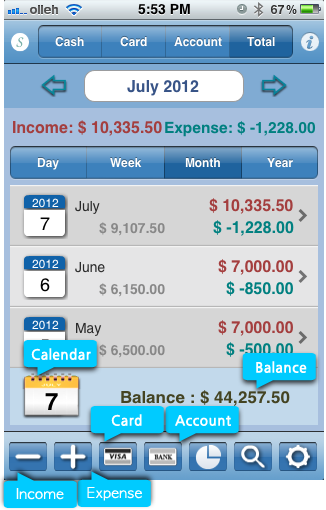 Monthly budget will be created when each first data of each month is inserted. See section About budget for more detail. 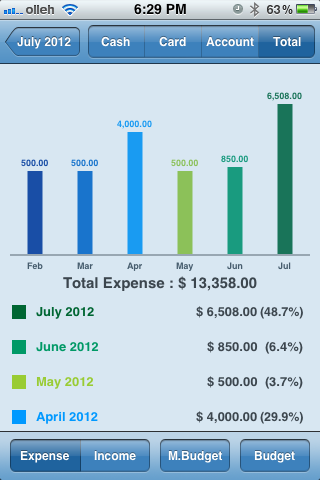 This is Budget vs Expense which shows monthly budget and monthly expense and income. 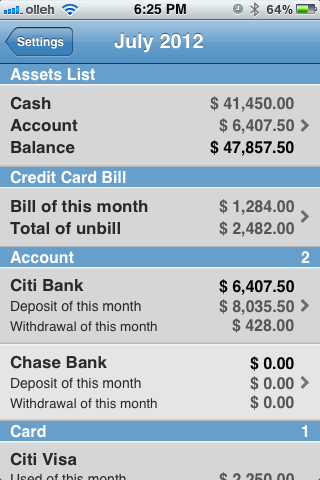 It shows used amount of cash and credit cards, bank accounts. See the section About budget for more details. This is List by category. 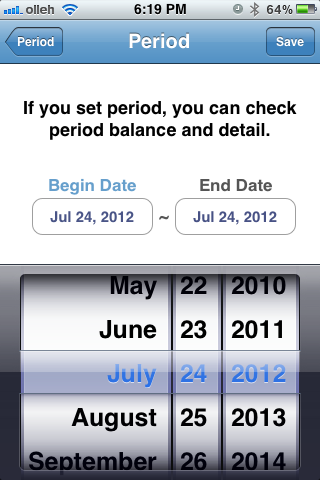 It shows list by categories and supports monthly list and period list and total list. Each row supports it’s detail list. 13. Detail list of category. 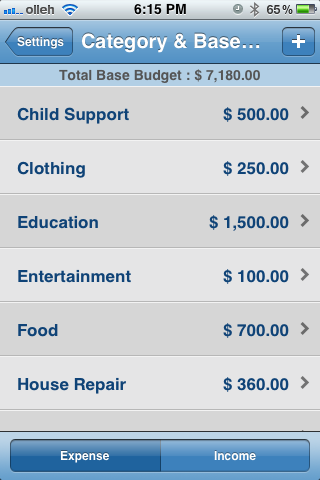 When you left-top button in the Main view, it moves to Total list. 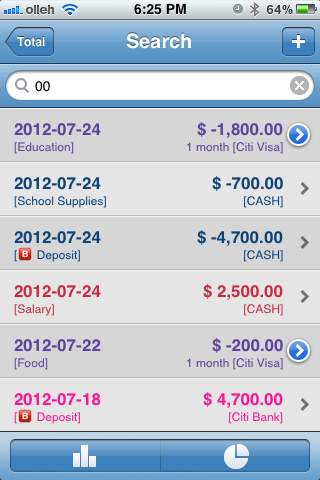 When you touch right-top information button of Main view, it moves to Card payment set. 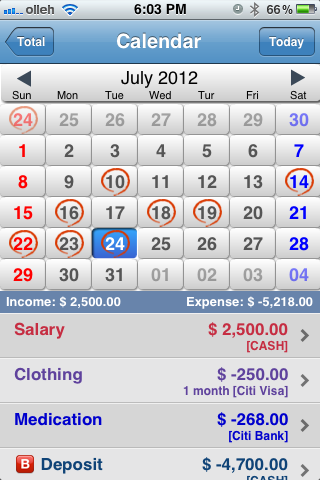 If you choose by-used-date, the expense will be aggregated by used-date. 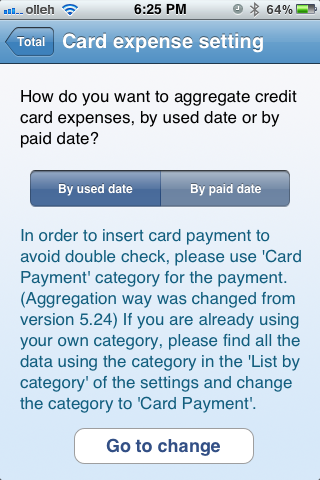 And if you choose by-paid-date, the expense will be aggregated by paid-date. 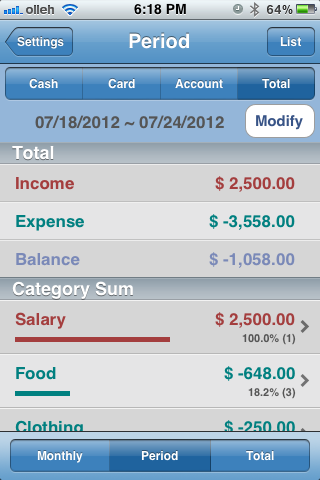 Assets list shows balance of cash and credit cards and bank accounts. This is Repetition list. You can see detail view when you touch each row. 22. Detail view of repetition data. 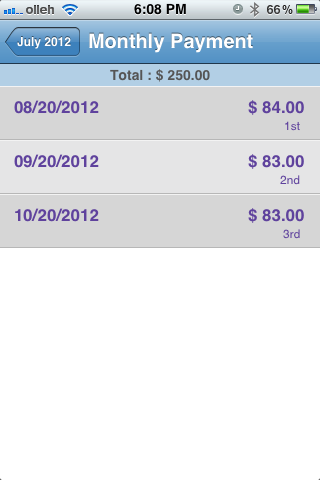 This id detail view of repetition data. Date and type of repetition is not allowed to change. 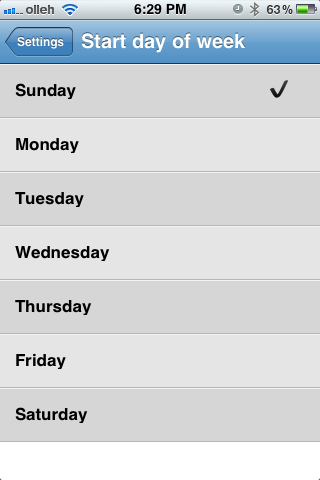 If you change start day of the week, you can see the result in the weekly list of main view. Tenho um iphone 5 e apos atuslização de 21/10/2013 meu aplicativo goldmoney pro não abre mais!!! O que fazer???? Em primeiro lugar, obter o seu arquivo de dados a partir de GoldMoney Pro através do iTunes File Sharing. 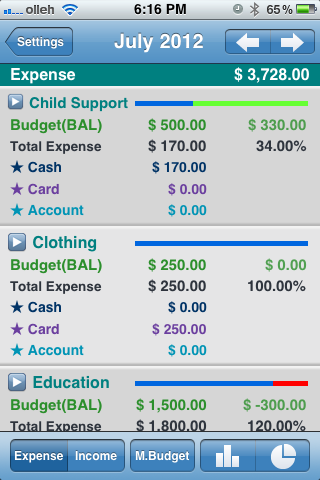 O nome do arquivo de dados é ‘cashbook_pro.db3. E excluir o aplicativo Pro GoldMoney. Em seguida, redownload GoldMoney Pro aplicativo da App Store. Re-baixando mesmo aplicativo é sempre gratuita. Depois redownloading GoldMoney Pro, restaurar o arquivo de dados via iTunes Shaing Arquivo. Se isso não funcionar , por favor me avise novamente. salvei o arquivo db3 no macbook. abri o itunes nos aplicativos, adicionei aquele arquivo db3 no quadro da direita embaixo e dai em frente não consegui abrir estes dados no goldmoney do iphone. ????? Agora mesmo com o redownloading, ao correr o dedo dentro do aplicativo, ocorre um “apagão” e entra a tela de início do iphone. Gosto muito do aplicativo mas não sei o que está acontecendo, sem contar que estou com 1 ano de contabilidade salvo em db3. It is working in iOS11. Have you tried to search the app in your first view on iPhone? Yes. It is possible. Please check iTunes backup and restoration menu in the settings menu. That might help you. Thanks. I had the original gold money – I updated and now can not open the program it flashes then disappears ! Further I seem to have lost all of the input frome before! 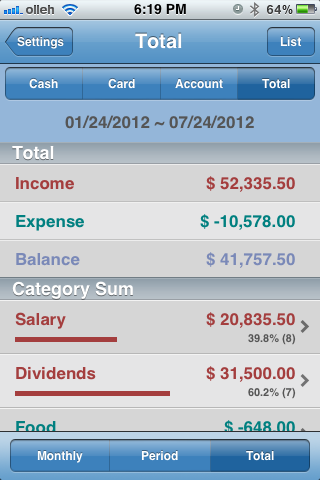 I am very upset as this was my record of income. There might be a problem in the lastest update. But when I tested it with my iPad it just worked with no problem. What is your device’s iOS version? Can I ask you to reply to brownapps@gmail.com? The new update version 7.3.4 is now available. Please update it and check if it works. Gold money pro for iPad version 7.3.8 is now available. Please update and check. Just drag and drop the file from the file list to the app in iTunes file sharing.